Air Medical, LLC (Air Medical) has been acquired by AirMed International, LLC (AirMed), a subsidiary of Air Medical Group Holdings (AMGH). AMGH is a portfolio company of KKR & Co. L.P. (NYSE:KKR). Air Medical is a CAMTS (Commission on Accreditation of Medical Transport Services) accredited air medical service that provides emergency air transport to the citizens of Texas and beyond. Provident Healthcare Partners served as exclusive financial advisor to Air Medical. The terms of the transaction were not disclosed. “From the beginning, I always felt as though Provident was a great partner for this process. Provident always had our best interests in mind and played a key role in bringing this transaction to a successful close,” commented Joe McCart, Chairman of Air Medical. “Joe McCart and his team at Air Medical have built an exceptional emergency air transport business with bedside to bedside service,” noted Steven Aguiar, Managing Director at Provident Healthcare Partners. “AMGH has been rapidly growing, and Air Medical will be the perfect addition for AMGH to expand its growing footprint, not only in Texas but throughout the entire country,” stated Justin Hand, Managing Director at Provident Healthcare Partners. Air Medical was founded in 2001 by Joe McCart and Eric Helton and has grown to be the largest fixed wing air ambulance company in Texas and in the Top Ten in the nation. The company’s base of operations is at San Antonio International Airport where its fleet has grown to three jets and two turboprop planes, and its flight team now includes 14 pilots and 16 medical personnel. The Company maintains its own Part 135 Air Carrier Certificate. For more information, please visit www.air-medical.com. With global reach, AirMed International is one of the leading air medical transport companies in the world, with more than 20,000 missions in all 50 states and over 150 countries on six continents. AirMed offers unparalleled medical care and bedside-to-bedside transportation on a worldwide basis and has some of the most experienced air medical crews in the industry. Chosen as a preferred operator for many of the top hospitals around the globe, as well as a contracted carrier for the U.S. Department of Defense, AirMed operates its own fleet of fully customized and permanently configured jets. With state-of-the-art medical jets and experienced and respected medical teams, AirMed is able to deliver an uncompromising standard of care. AirMed owns and operates all aircraft, as well as employing its own dispatch, fight, and medical teams. This vertical integration ensures seamless service and world-class care 24/7/365. AirMed provides worldwide services from multiple bases strategically located across the globe. With accreditation from both CAMTS and EURAMI, AirMed is able to deliver excellent transport experiences to customers regardless of location. 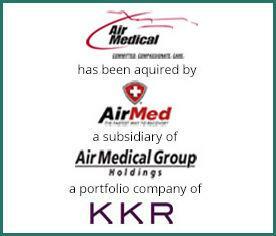 AirMed International is an Air Medical Group Holdings company. For more info go to www.airmed.com. AMGH is the largest independent provider of emergency air medical services in the world operating through five subsidiaries: Air Evac Lifeteam, Med-Trans, REACH, AirMed International and Lifeguard, which collaborate with leading hospital systems, medical centers and EMS agencies to offer improved access from America’s outlying communities to higher levels of care. Headquartered in Lewisville, Texas, AMGH offers an array of customized air and ground medical program designs. AMGH is a team of more than 6,000 professionals focused on safely transporting and caring for the critically ill, and provides services from approximately 270 operating locations using a fleet of 300 medically-equipped helicopters and fixed wing aircraft along with 200 ground ambulances. AMGH is a holding of KKR. For more information, please visit www.amgh.com.